I’m back from Utah. Ruby was a great travel companion. Whenever she rides in the car it’s like she can’t stop herself from falling asleep. I thought this only applied on short trips to the park or Petco, but not so. So she slept the six hours from Vegas to Utah Right there on the seat next to me just being precious the whole time. We made a pit stop at the halfway point where I took this great picture of Ruby looking like a hoodrat. I had a blast in Utah though I was reminded of the three reasons that may keep me from ever moving back there: January, February, March. Utah is a really beautiful place but during those three months the things that make it beautiful are either dead or hiding under dirty snow. Of course I don’t really care because the one reason Utah will always be home is the people there that I love and adore. And that love will always outweigh dirty air and lifeless trees. And I got to spend lots of time with many of those lovely people during my stay. The main reason for my trip was a Bachelorette Party and Bridal shower for my incredible friend Danica. I helped host the Bachelorette party and I will be sharing the invitations and decor I designed for it next time…and that’s all I will be sharing from that night. With anyone. Ever. On Sunday my siblings and I threw a surprise 30th anniversary get-together for our parents. It was crazy putting it all together since we only had one day to do it, but that was half the fun. Other things I loved about my trip include Ruby meeting her pug-cousins, Jojo and Ollie, staying up late with my sister, trying Taco Amigo for my first time ever and best/worst of all – enlisting the help of my mother to create an “adult” themed cake. I call a lot of places home but Utah has my whole heart. The image at the top is a print I made to hang on my wall when to help me remember this. If you’d like your own 8.5 x 11 print click the following link to download it for free. I’m in love with your “This is the Place” print! Utah is exponentially cooler when you are in the state. Thanks for visiting! Come back again soon and I’ll feed you more things made of delicious! 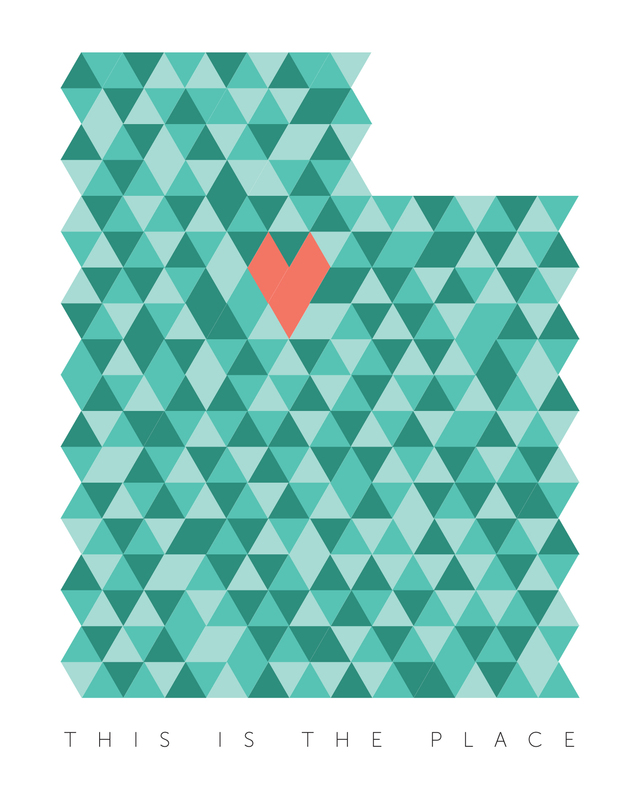 And now, all I want to do is make a quilt with triangles in the shape of Utah. Dang you. April, I have friend who saw this and was inspired to do just that! She’s working on it now, I’ll share pictures when she’s done! I recently moved away from Utah (to northern Alberta. Now that’s cold!) and miss it so much. I love this print! I tried to download it but keep getting an error page that says, “File Not Found.” GAH! Any ideas? Alexis – Sorry about the problem with the file! Not sure why it stopped working in the first place but it’s working again now…or at least it should be. If you’re still having problems opening the link, send me an email at natbussio@gmail.com and I can email you the file directly.